Jean-Georges Vongerichten's popular ABC Kitchen is probably known as much for being a happening dining spot as it is for it's award winning fresh and organic cuisine. Adjacently located to ABC Carpet and Home, the open space has an eco-chic vibe with homey rustic touches and decor crafted from salvaged materials. The atmosphere is trendy yet laid back and inviting. The seasonal and locally sourced sustainable menu impressively offers a expansive variety of dishes and the food itself was equally impressive. Everything we ordered tasted incredibly fresh and well seasoned with the exception of an artichoke dish that just missed the mark on flavor. The toast options are a signature of the restaurant and the crab toast did not disappoint. The roast carrot and avocado salad with crunchy seeds, sour cream and citrus sounded simple but the texture and taste was unexpectedly flavorful and refreshing at the same time. Our table shared the sundae with salted caramel ice cream candied peanut, popcorn, whipped cream and a rich chocolate sauce. It was such a decadent treat and satisfying at just a few bites. That said, I'm not a dessert person at all. The service was friendly and attentive without being overbearing. I'd heard great things about this place and it lived up to them. This was a very satisfying dining experience overall. One negative against this restaurant is that scoring a reservation can be challenging as you have to make it pretty much a month in advance to the day before you want to dine there. A last minute reservation may be possible if you're willing to dine earlier or later. Another option is to take a chance and walk in and you might be able to get a seat in the bar area which was bustling when we were there. Im drooling just looking at the photos. I'd love to try the crab toast. Ive heard a ton about the place. Good to know about the reservations, thanks for the review. This restaurant is divine and the food delicious you did an amazing job presenting it. You don't even know. 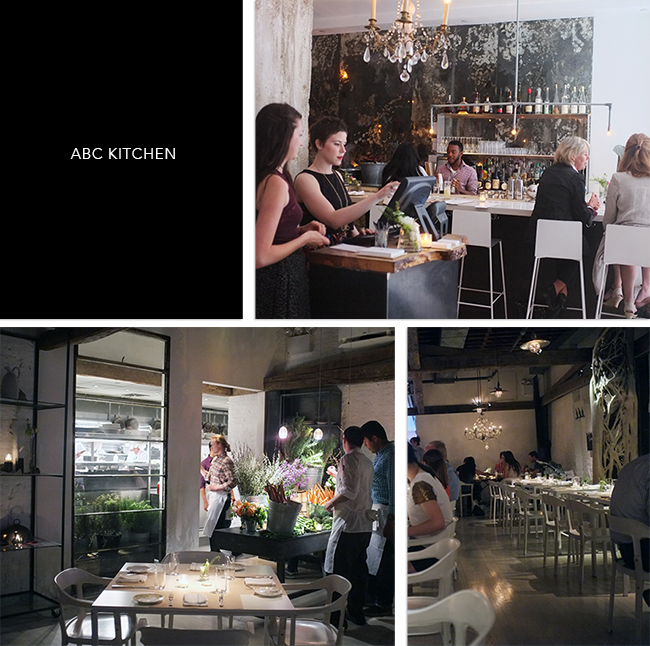 I have been wanting to eat at ABC Kitchen for the longest, but I'm always way too late to get a reservation. Case in point: I attempted to get a reservation for this Friday a few days ago and the only reservation available within 2.5 hours of that time is 2-3 weeks from now. Oh well! Maybe someday I'll luck out with the bar. Hello, i am Royal,long time no reading each other,i have been busy those periods,how are you? O yes please! It all looks amazing and I love the look of the restaurant. FUN post! Wow! This is such a lovely place to dine, healthy and beautiful at the same time. Look at those dishes! Rowena, you are making me really hungry now *_^ Thanks so much for sharing. Nice pics! my goodness everything looks amazing! i love their fresh flowers too! what a perfect addition to a dining experience! I don't know how and when, but I have to dine at this place, this is my kind of food, fresh, healthy and amazingly presented! Thanks for your kind visit! This place and food looks amazing! I've heard nothing but good things about ABC Kitchen and the pictures you posted are mouth-watering. It's on my list of restaurants to try some day! Oh mu this sounds soooooo good!! I will have to check this out sometime soon. Yes I will let you know if I take that class. It just happened in NY so may be a while but I will let you know. Lovely place and delicious food!!!!!! I've been there before -- it's great! For that dessert I think I would take a reservation for any time that they had one! The interior looks great too. Fresh and organic cuisine immediately get me interested, I like the beautiful decor. I am literally drooling when you described each dish, Rowena. The food looks so delicious Rowena! I like the roasted halibut! Yum!!! Love the ambiance. Wow, a month in advance. I bet that deters a lot of people. That's a long time. Excellent review! Lovely review, Rowena.The meals I've had at Jean-Georges at the trump hotel are on my all-time favorite list - this place looks fab, I can't wait to try it in person! Ah! This is one classy restaurant! Yummy food too. Looks like such a great place and I want that carrot and avocado salad! this sounds like a fantastic place for a dinner date! love that it's still fancy yet not too formal, just nice to spend some quality time with friends or loved ones over a nice meal! and awesome food photography there too! Lovely pics and great food! Wow, that just look so pretty and delicious! It sounds like the perfect place! wow, this restaurant looks so amazing! I visited NYC in 2012 for christmas and I absolutely loved it; all of the restaurants were lovely, especially in SoHo and Tribeca! Lovely blog! I've actually never heard of this place before! It sounds and looks so nice. The way you described the carrot and avocado salad left my mouth watering! Ohh this restaurant looks so nice and the food looks delicious! Wow all that food looks amazing! Oh this looks like such a nice place! everything looks delicious! Great place to eat in the city Now i am hungry!! I wrote a whole comment responding to your sox comment but it didn't publish and I lost it....I never pay attention to Coach either but the window I found was so bright I liked it for spring. Perhaps it was on Madison Ave so they felt like they had to step up their game? Have a great weekend! I hope your weather is as beautiful as ours today!